I thought I'd post this example of the Ceylon Volunteer Service Medal. I have always thought this was an under appreciated WW1 medal. Being a non-wearable award probably explains the lack of interest in this medal. It was awarded to volunters from the Ceylon Forces who served overseas. 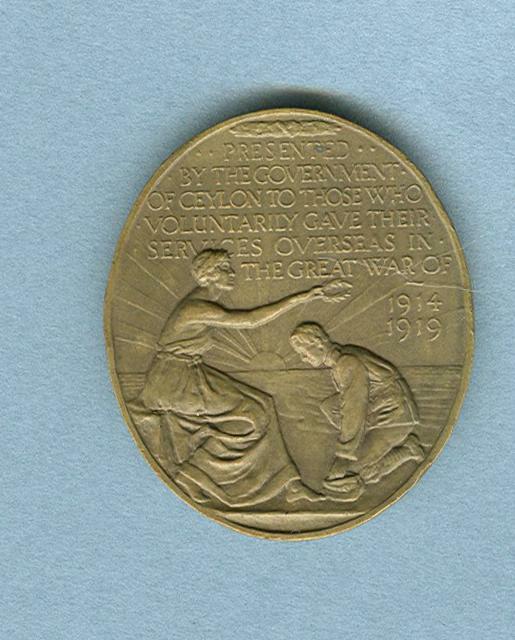 Ceylon was the only British Colony to award such a medal for war service. Is there a Roll to trace these, or has that gone with the change in government? I've never seen reference to a roll for these. The dead guys show up on the CWGC site, but those who lived don't seem to be recorded in easily reached sources. I believe a roll existed (exists?) in Colombo. Work currently underway on Ceylonese/Sri Lankan medals may reveal all. I am asking the experts. This is my first posting. I've just stumbled across GMIC, but am a long-standing member of several similar fora. I suspect I shall come across numerous old hands in this forum, (and have already noted several); and look forward to making new acquaintances. As the signature block should indicate, (if I set things up properly), my primary interest is in collecting and researching Orders, Medals, Decorations with a Ceylon connection -- ie., either to a recipient in a Ceylon unit, (such as the Ceylon Planters Rifle Corps, Ceylon Light Infantry, or Ceylon Mounted Rifles) or to a resident of Ceylon (for example, many Ceylon planters, during the Great War, served in Indian, Aussie, or Brit units). I'vm also interested in medals to the Royal Indian Navy/Marine. I can help with some intell on the recipient of your medal. He is David Edgar Smith, born in Colombo Ceylon (Sri Lanka) in 1893; and educated at St Joseph's College, Colombo. Before the War, he was an Engine Driver for the Ceylon Government Railway. He left Colombo, for "Home", shortly after the outbreak of the war, enlisting in the Rifle Brigade on 13 Dec 1914; landing in France on 20 June 1915. He was wounded 3 times (but I don't know the dates); and took part in the Battles of: Loos; the Somme; 2nd; and 3rd Ypres. He was taken prisoner during Germany's great Spring Offiensive, on 22 March 1918. 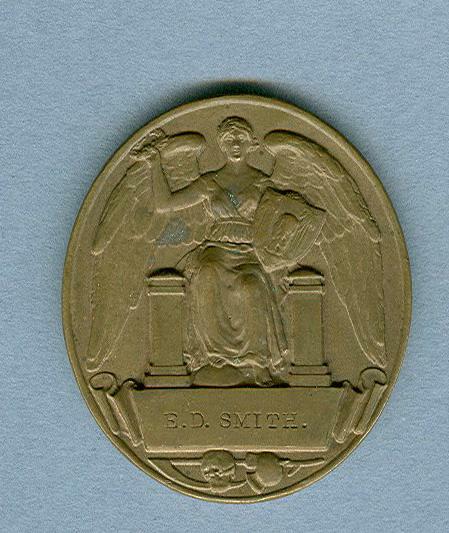 Smith was repatriated to UK in January 1919; and de-mobbed in May 1919. After the War, he returned to Colombo, where he retired, settling at 22 Dematagoda Road, Colombo. Unfortunately, these medals tend to get separated from the rest of the group. Smith would have had a nice trio. There is a roll of recipients at the Sri Lanka National Archives, a scan of which I have attached below. (Note as well as confirming his entitelment, the roll indicates the medal was sent to him on 9 Jan 1922). For years the Medal Year Book cited the figure of 450 as the total number of these medals issued. I have no idea how they arrived at this figure but it's patently wrong: the actual number is closer to 3,000. I wrote to the editor, indicating the error, and they removed any reference to a number issued about 2 years ago -- bit, unfortunately, many dealers still like to cite the erroneous MYB figure thereby greatly overstating it's rarity. Hope this is of some help/interest. Thanks Glenji, welcome over here (too)! Hello, I've just stumbled across this old discussion as I'm currently trying to research the recipient of a QSA medal on my collection. Alexander Macpherson Blair - this gentlemen served as 7532 Pte AM Blair Ceylon V Coy Gloucester regt in 1902 and then with the CPRC as Captain in Gallipoli before being transferred to 2nd batt South Lancs regt where he was KIA leading C company into an attack on the german trenches near Thiepval 3/7/16. I would love to reunite his group someday. Question is would he have qualified for the Ceylon volunteers overseas service medal too? continuing the earlier message . on 9/11/ 1915 on the ill fated French Boat Ville de le Ciota for the Western Front. the ship was sunk by a German U boat ( U 34) on Christmas Eve 1915, circa 80 perished, including some of the CLI Volunteers. My great uncle survived , was picked up we understand, by a British ship , and went to Liverpool where he recovered and joined the First Sportsman's Battalion ( 23rd Battalion) , Royal Fusiliers. He went to the western Front in 1916, and was KIA on 3rd December 1917 in Boulogne Wood during the Battle of Cambrai. His portrait was unveiled in the Diyatalawa army HQ , we gather in 1936, in the uniform of a Royal Fusilers. The letter from Lt Col E R Freeman to my great grandfather, C J Aiyadurai, talking about Richard Aiyadurai is quoted in the publication " NOTES ON JAFFNA" by John H Martyn. He is referred to as having been " sniped through the head and killed instantly whilst firing at the enemy... and is described as a " very gallant man. He set a fine example to all ranks on account of his cleaniliness , smartness and cheeriness etc.. "
I wonder if his name appears in the list of recipients of the Ceylon Volunteer Service Medal and how one finds out? Unfortunately we lost all his medals during WW2, during the Japanese occupation of Malaya in 1942.